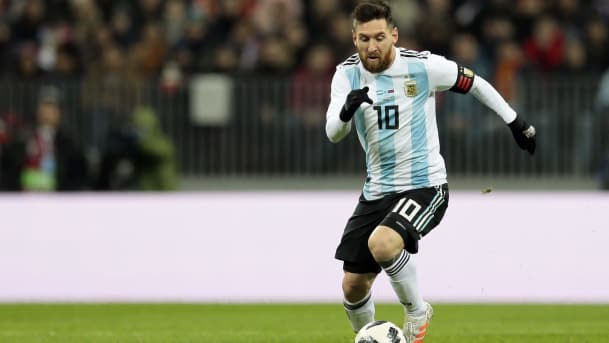 (June 6) – Argentina’s planned soccer exhibition against Israel’s national team slated for Saturday at Jerusalem’s Teddy Kollek Stadium is in danger of being canceled, Argentine media reported. Local reports claim Palestinian pressure is the impetus for the game’s expected cancellation. Neither side has issued an official announcement yet regarding the World Cup warm-up match that has attracted huge interest among Israeli fans, mainly because of Messi’s planned participation, but the game is largely expected to be canceled. Prime Minister Benjamin Netanyahu spoke with Argentine President Mauricio Macri late Tuesday, at Culture Minister Miri Regev’s request, in an attempt to prevent the game’s cancellation. Macri informed Netanyahu in a follow-up conversation, however, that he is unable to influence the final decision, according to sources in the Prime Minister’s Bureau. Star Argentine player Gonzalo Higuaín told ESPN that “the correct thing is to not go to Israel.” It should be noted that the Argentine national team did not want to play in Israel in the first place, but preferred to prepare in Barcelona for the World Cup, which will open in nine days in Russia. In recent days pressure has been exerted on Messi and the Argentine Football Association not to play in Jerusalem; this has included demonstrations in Buenos Aires and Barcelona in front of the national team’s training camp. Jorge Sampaoli, coach of Argentina, who was not interested in a game in Israel, complained about it again in the last few days. In Argentina they say the chances of Israel going to Barcelona are small and that they have already started looking for another training rival. Argentine newspapers, including Ola, Klarin and others, as well as local sports websites, are claiming the game had already been canceled and that the Argentine Football Association had already notified the Israeli association of this. The Palestine Football Association chief urged fans on Sunday to burn pictures of Argentina striker Lionel Messi and replicas of his shirt if he plays in the match. Palestinians are not happy that the match will be held in Jerusalem and Palestinian FA chief Jibril Rajoub wrote to Claudio Tapia, the head of the Argentinian FA, last week accusing Israel of using the match as a “political tool”. However, the status of the city generally is highly sensitive. The match was originally slated to be played in Haifa but Israeli authorities contributed funding for it to be moved to Jerusalem, irking Palestinians further following U.S. President Donald Trump’s recognition of the city asIsrael’s capital. The U.S. embassy was moved there last month. “The Israeli government has turned a regular sports match into a political tool. As was widely covered in Argentinian media, the match now is being played in order to celebrate the ’70th anniversary of the State of Israel’,” part of Rajoub’s letter said. “He’s a big symbol so we are going to target him personally and we call on all to burn his picture and his shirt and to abandon him. We still hope that Messi will not come,” he told reporters after leaving the Argentinian representative office in the West Bank town of Ramallah. Most countries do not recognise either Israel’s or the Palestinians’ sovereignty in Jerusalem and have embassies to Israel in the Tel Aviv area. However, Guatemala and Honduras followed the U.S. lead in moving their embassies last month.